The Folger Shakespeare Library organized the First Folio tour to mark the 400th anniversary of the playwright’s death. MIDDLEBURY, Vt. – Art exhibits and musicians go on tour but what about an almost 400-year-old book? William Shakespeare’s First Folio—the first complete collected edition of his plays and one of the world’s most influential books—is coming to the Middlebury College Museum of Art February 2-28. The exhibit, “First Folio! The Book that Gave Us Shakespeare, on tour from the Folger Shakespeare Library" marks the 400th anniversary of the playwright’s death. Along with the month-long exhibition, the College will host performances, a workshop, speakers, a film screening, family events, and a folio festival that features Renaissance music, gallery talks, and a live theater performance. Middlebury collaborated with several community partners, including the Ilsley Library and the Town Hall Theater, to offer a number of the activities. “It is because of this book that Shakespeare is known as the most famous author in the English language,” said Middlebury Director of Special Collections Rebekah Irwin, who organized the events. The First Folio includes 36 Shakespeare plays. Eighteen of them, including Julius Caesar, Macbeth, and Twelfth Night, would probably have been lost without the creation of the First Folio. Compiled by two of Shakespeare’s friends and fellow theater colleagues, it was published in 1623–seven years after his death in 1616. Just 233 copies of the First Folio survive today, 82 of which are in the Folger collection in Washington, D.C.
An image from one of the Shakespeare First Folios at the Folger Shakespeare Library. The Folger will send out a total of 18 First Folios across the country. Some of them will make multiple stops so that every U.S. state will host a First Folio at some point during the tour. Middlebury College will serve as the host site for Vermont, and is among the first 10 sites where the First Folio will be on display. The exhibit locations include 23 museums, 20 universities, five public libraries, three historical societies, and a theater. The complete list of host sites and tour dates is available on the Folger’s website. 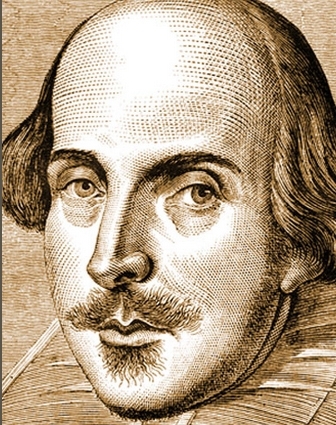 The First Folio will be opened to the most quoted line from Shakespeare, “to be or not to be” from Hamlet. Accompanying the book will be a six-panel exhibition exploring Shakespeare’s impact, then and now, along with interactive, digital activities. Highlights of the associated events at the College include a keynote talk on February 3 titled “Shakespeare in America” by James Shapiro, professor of English and comparative literature at Columbia University. Shapiro will explore how Shakespeare’s works have served as a prism through which Americans have experienced major historical events and issues, from revolution to social justice. The talk is co-sponsored by the Vermont Humanities Council. On February 18, the First Folio Festival will take place in the lower lobby of the Mahaney Center for the Arts from 4:30 to 6 p.m., and it will feature Renaissance music, gallery talks, and a live theater performance celebrating the exhibition First Folio! The Book that Gave Us Shakespeare. At 4:30 p.m. the Penny Lane Consort will perform music of Shakespeare's time on recorders, sackbut, and other instruments. At 4:45 and 6:15 p.m., join Middlebury College professors James Berg and Timothy Billings for gallery tours in the Museum of Art. At 5:00 p.m., the Middlebury Actors Workshop will perform Straight Up Shakespeare, an energetic, fast-paced romp through Shakespeare's world. This free performance will feature Shakespeare's most famous scenes and sonnets, linked together with original commentary that will demystify Shakespeare for all ages. The Mountain Ayres, Middlebury College's co-ed acappella group dedicated to the appreciation and performance of Renaissance music, will serenade visitors until it is time to say, "Good night, good night. Parting is such sweet sorrow." Also enjoy Renaissance refreshments and children's activities. "Shakespeare selfies" will also add to the festival atmosphere. Off campus, the Ilsley Library in Middlebury will host a Shakespeare story time, a screening of “The Lion King,” and a Shakespeare film-making camp. Beyond Addison County, there will be talks by Dartmouth Professor Emeritus Peter Saccio at Norwich Congregational Church and by Middlebury College Professor of English Timothy Billings at the Brownell Library in Essex Junction. All events are open to the public and all, except for one, are free (tickets are required for one performance/master class). More information is available here. What are some common expressions that were either coined by Shakespeare or popularized by him? Why is the First Folio coming to Middlebury College? One of the most important books in the English-speaking world, Mr. William Shakespeares Comedies, Histories, & Tragedies, is commonly known as the First Folio. It is believed that about 750 copies of the First Folio were published in 1623 and that 233 copies survive today. The book preserves much of Shakespeare’s canon, as well as the author’s only authenticated portrait. It saved from oblivion 18 plays that had not previously appeared in print, among them The Tempest and Macbeth. Were it not for this book, Shakespeare would not be known as the most famous author in the English language. The First Folio is coming to Middlebury College as part of an international celebration marking the 400th anniversary of Shakespeare’s death. In the United States, First Folios will visit all 50 states, the District of Columbia, Puerto Rico, and the U.S. Virgin Islands. Middlebury College has been chosen as Vermont’s sole host for this exhibition. What does hosting the First Folio mean for Middlebury College as an institution? Being chosen to represent Vermont in this event is a great honor. Middlebury was selected as the state’s sole site for this tour, in part, because of the College’s influence as a cultural and liberal arts hub for Vermont, as well as its central location within the state. Half a dozen Middlebury faculty teach and study Shakespeare through literary, theatrical, environmental, cinematic, and musical perspectives. Having the folio on campus will offer countless educational opportunities for students and faculty. The First Folio will also give Middlebury College an opportunity to encourage residents of the community and the state to visit campus for the exhibition and related activities. What do the exhibit and related events offer to Vermonters? Vermont is the nation’s second least-populated state and the second most rural state. It is unusual for Vermonters to have local access to this type of cultural event, as national touring exhibitions like this are usually hosted in major cities. For many visitors to Middlebury’s exhibition, this might be their first and perhaps only chance to see this rare and influential book. Opportunities for education will extend to students, faculty, staff, and to the larger community. All through February, Middlebury College, along with the Vermont Humanities Council, the Town Hall Theater, and Ilsley Library, have planned activities. Professor Cubeta's Shakespeare seminar (meeting at his home) was the highlight of my Middlebury education. I did a Master's thesis on Antony and Cleopatra. What a great honor for Middlebury. Interesting that Paul Cubeta's seminar was mentioned, as I also had him as a Shakespeare professor my senior year. My interest in Shakespeare was further developed and polished at Bread Loaf, both in Oxford and Vermont. I'll be running the Shakespeare video camp mentioned in the article. We'll be making stop-motion animations over February vacation--look for them later in the month on Ilsley's Youtube channel! As someone who holds an MA and MLitt from Middlebury's Bread Loaf School of English and who first became hooked on Shakespeare upon seeing Alan McVey's 1980 production of A Midsummer Night's Dream and taking a Shakespeare class with Alvin Kernan that summer (one that Paul Cubeta audited! ), I congratulate Middlebury College on this honor. I am happy to be the project director for Hawaii's host site for First Folio! and hope any Middlebury folks visiting Oahu from April 25-May 25 will think about visiting the exhibition or ancillary events here. I was in that play, Mark! Was one of the prancing fairies and that experience transformed me...then went to Oxford to study Shakespeare and His Contemporaries my last summer graduating with my MA at both Oxford and Bread Loaf ceremonies...Middlebury rocked my theatrical and literary world! I remember that performance of Alan McVey's 1980 production of "A Midsummer Night's Dream" very well. He used Pachelbel's Canon for the last scene: just magical. I went to Oxford to study Shakespeare's comedies with John Wilders: such an actor!!! I am so thankful for my study at Middlebury's Bread Loaf School of English.